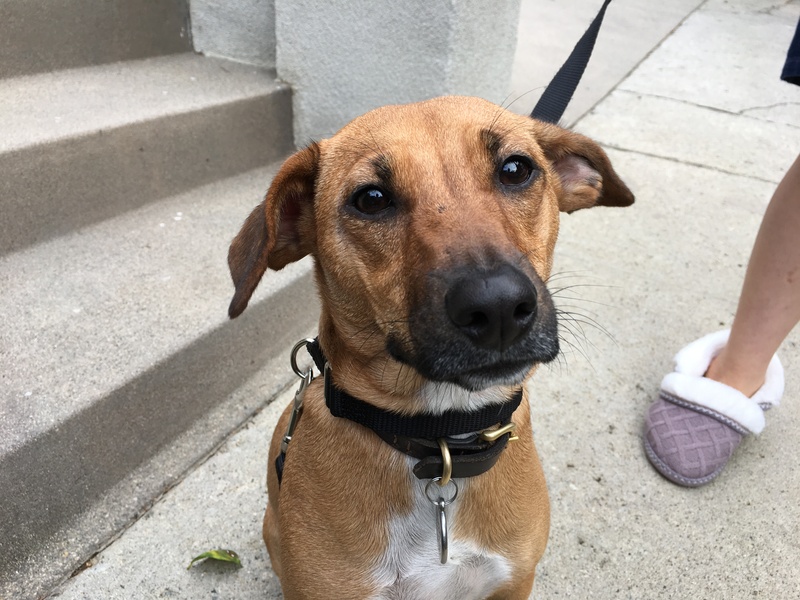 Cashew is a eight-month-old Beagle mix puppy who lives in Beverlywood, California. Her guardian scheduled a puppy behavior training session with to stop dog barking, some leash training to stop pulling on the leash stop chewing things and getting over excited at times. Cashew was pretty excited to meet me and had a nice wiggle going on. She came in close to give me a few good sniffs before attempting to jump up on me. I brought my leg up in a pseudo marching motion to block her with my shin while making a hiss sound. After this minor correction, she settled down which tells me she is a pretty smart and observant puppy. Seeing a puppy recognize and learn is one of my favorite parts of being a dog and puppy trainer / behaviorist. I kept doing double takes as I sat down with Cashew and her guardians due to the puppy looking almost identical to a dog I know in Omaha. He is a mixed breed who lives with a neighbor of mine and his name is Poppy. There are a lot of variables when you have mixed breed dogs, but aside from her eyes being slightly darker and about 25% smaller than Poppy, the resemblance was uncanny. 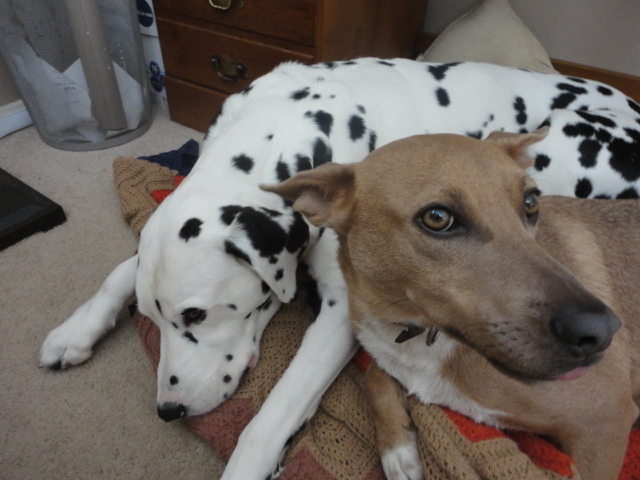 Here is a pic of Poppy hanging out with my Dalmatian Farley. Back to Cashew. We started things off by chatting about her daily routine and the structure her guardians were providing. As it turns out, Cashew had some structure, but not many rules. This often gives a dog the impression that they have the same authority as the humans they live with. If the pup thinks that it has the same authority as humans, then listening to them can become optional. I suggested a few that will help the guardians start acting like an authority figure in the dog’s eyes. It will be important that everyone in the home consistently enforces these new rules with good timing (correcting the dog within 3 seconds max). Because dogs learn through association, the timing of our corrections is what helps a dog understand why they are being rewarded or corrected. To help the guardian see things coming earlier, I spent a couple of minutes going over some different ways the puppy will communicate through body language and posture. Knowing what to look for is huge when it comes to communicating with our dogs. Seeing things that signal your dog is stressed, excited, fearful, anxious or frustrated can help the guardian know when to redirect the dog, correct or reward it. I noticed that the guardians had gotten into a habit of repeating themselves when Cashew didn’t comply the first time. But when we repeat a command over and over or call a dog by name when they are distracted, we are actually training it to ignore us in the future. I suggested that the guardians stop repeating themselves and shared a series of escalating consequences that they can apply instead. Being a sensitive and sweet dog, the guardians need to be careful to not correct her too loudly with these new communication methods. By loudly I mean not using too much intensity as these are mostly non verbal commands. You always want to use the least amount necessary especially when you have a sensitive puppy like Cashew. We want to keep her out of trouble but not damage her precious spirit. Because of her warm and loving demeanor, Cashew’s guardians were loving her up often throughout the session. While petting a dog is a healthy and beneficial thing (for the humans and the dogs), I have found a amazingly simple way to add a twist to this recurring interaction that helps build up respect for the pup’s guardian as authority figures. This sort of positive puppy training is both easy and extremely effective when it becomes a habit. Its going to be hard for the family to not pet Cashew simply because she looks so cute. But if everyone gets into a habit of asking her to sit or lay down first, they will help Cashew identify as a follower and have good manners when meeting and interacting with humans. It was pretty obvious that Cashew really wanted to please her humans but also had a great amount of puppy curiosity and energy. Sometimes she got distracted or lost focus when she was engaged in something when her guardians called so I wanted to introduce an exercise that will help her learn to listen for her humans and focus on them when they ask for her attention. Cashew really responded to the Focus exercise with me so I had her guardian take a turn next. I was quite pleased with how well both human and canine did. Its clear that the dog has a strong bond with her human and this exercise showed that. While Cashew did great at the focus exercise, it will take a good amount of practice before it becomes second nature. Once that is the case the guardian will be able to use the exercise to redirect Cashew’s attention when she gets upset, excited or reactive to things in and outside of the house. But in oder for the Focus exercise to work amongst distractions, her guardian will need to practice the exercise along with various levels of difficulty and distractions. I cover just how to do that in the following video. The Focus exercise is really easy to learn and practice, but it takes a number of practice sessions under varying degrees of difficulty. But seeing the sparkle in Cashew and her guardian’s eyes as they practiced it tells me that this pair will have the exercise down pat in no time. Just make sure that the practice sessions are short and always end on a good repetition. Because Cashew was a bit of a door dasher, I wanted to show her family how they can use what we introduced in the session to teach Cashew to behave at the door. We had a family member step outside to play the part of a guest while Cashew’s primary guardian and I took a seat in the living room. I wanted to make this as close to a “real” guest arriving as possible. Cashew did beautifully at the door exercise. She was a little more reserved and withdrew more than I would have liked, but its important we let her learn things at her pace so she feels confident and empowered. This is why I don’t tell the dog what do do, ie sit, or lay down somewhere, I simply don’t want her to get too close to the door when someone is knocking. But the real test is to make sure that Cashew’s guardian can get the same results on her own so we reset things and practiced answering the door again. Cashew got a little confused at first; trying to go up the stairs instead of away from the door. But once the guardian offered a gentle hand, Cashew did great. I recommended that the members of the family call or text one another when they are close to getting home so that they can practice this exercise. This really helps as the humans know someone is about to come to the door. Usually we are unaware and since it catches us by surprise, we can inadvertently send the dog the wrong message (that we are startled or flustered). Because dogs learn through association, this can cause them to think their human’s reaction is due to being upset by whoever is at the door. So knowing someone is about to knock helps us avoid that message. NOTE: Be sure to act casually and be lounging around as you usually do. Do NOT stand around the door. You need to be as normal as possible. Now that we had addressed all the indoor issues, we were ready to address Cashew’s behavior on walks. Knowing that Cashew liked to pull on the leash, I brought a Martingale collar and showed he guardian how she can add a simple twist to the leash to giver her more control and stop Cashew from pulling. I went over my rules for a structured walk and some basic leash training tips before we headed out for a short jaunt around the neighborhood. The guardian was quite pleased with how well Cashew responded to the Martingale collar and new leash training tips. When we passed the mail man and Cashew didn’t bark, I knew we were on the right track. But when the mailman did a double take, thinking Cashew was a different dog due to not barking at all, I knew we were making great progress. The guardian needs to remember to make the leash corrections quick as soon as Cashew’s chest gets an inch or two in front of her torso, and then immediately remove all tension from the leash. This means no pulling the dog into position. This is a common mistake that many humans make but doesn’t work as the action will activate a dog’s opposition reflex. By the time we wrapped up the session, Cashew was listening and responding to her guardian’s commands and corrections right away, was already starting to sit to ask to be petted and as you saw in the last video, behaving very well on the walk. Practicing the focus exercise, petting with a purpose, enforcing rules consistently with good timing and using the new non verbal communication cues should help Cashew learn exactly what her guardians do and do not want from her. With a little practice, this puppy will grow up to be a calm and well behaved adult.